The painting "Imprint", egg tempera on panel, is included in this year's exhibition. 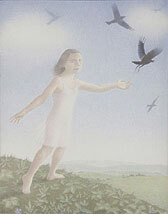 A detail from the egg tempera painting "Gatekeeper" was selected for the cover of the 2012 publication by Kathleen Weihe. Opening reception April 29, 6-9 p.m.
based on the collage of drawings. Opening reception October 29, 6-8 p.m.
reception Friday, June 12, 6:30 - 8:30 p.m. Opening reception October 30, 6-8 p.m. Opening reception Tuesday, July 24 at 5:00 p.m..